this store has become the laughing stock of the internet. view at own risk. Total Shutdown / XBXRX Split double 5"600 Pressed on clear red and clear blue vinyl on the wonderful Rock is Hell Records. Artwork by Dennis Tyfus. Hand Numbered. Insane packaging!. 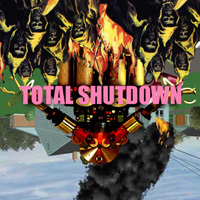 Total Shutdown - The Album Vinyl on Load Records, CD on Tigerbeat6 Records. First full length and studio recording from Total Shutdown since early 2002. Recorded by Kurt Schlegal at Lucky Cat Studios, 16 tracks (all were used) analog 1 1/2 reel, 13 songs clocking in at just over 26min. Recorded January 20th 2003 in San Francisco, Released October 20th 2003. Vinyl Load-057: 1000 pressed on black vinyl, CD meow-097: 1300 pressed. 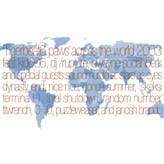 Various Artists: Tigerbeat6 Paws Across the World 2003 Tour Sampler compilation put out for the Tigerbeat6 Paws Acrossed America Tour. 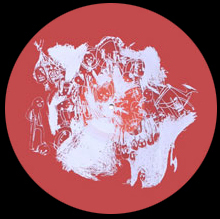 Features the following artists: Kid606, DJ/Rupture, Dwayne Sodahberk, Sound Murderer, Dynasty, Jonosh Brando, Puzleweasel, Skeksi, Donna Summer, Total Shutdown (Six), Terminal11, 0=0, End, Dev/Null, Titwrench, Nice Nice, RandomNumber, Stars As Eyes, trt. Various Artists: Frisco Styles Out on JAck Hanley Gallery Records and Art Visuals / Now Rainbow Records. This compilation is a double CD compiled by Chris Johanson. Features the likes of Total Shutdown, Nate Denver's Neck, Erase Errata, Coachwhips, Dynasty, NAM, Caesura, Mr. and Mrs. Evil, Tarentel, Condor, Uber Murder, Track Star, A Tension, Troll, Quails, Aislers Set, Mesh, Crack, Zeigenbock Kopf, Tussle, Deep Throats and many many more. Burn My Eye! Best of DVD. A television show about Rock and Roll. This DVD features two hours of live music and non-live stuff from the following groups: Coachwhips, Deerhoof, Extreme Elvis, The Locust, The Lowdown, Numbers, Total Shutdown. Originally airing on San Francisco Cable Access channel 29, this DVD compiles the best of the first 12 episodes. Created by Virgil Porter. Burn My Eye! Episode #3 of 12 VHS tape. Original air date: 7-3-02, Total Running Time: 30 minutes. A television show about Rock and Roll. This VHS tape features 30 minutes of live music and non-live stuff from the Lo Fi Neisans and Total Shutdown. Originally airing on San Francisco Cable Access channel 29, this DVD compiles the best of the first 12 episodes. Created by Virgil Porter. 100 hand numbered black VHS tapes with silver sleeve. Broadcast Performances 7" Ep recorded live on the Radio. 1000 pressed, black vinyl. Courtesy of Life is Abuse records. Was released in mid April 2002. 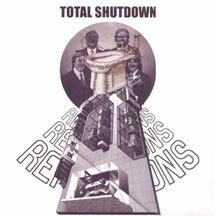 Reflections Total Shutdown's long in the making One sided 12" vinyl record album EP. For those of you who don't know anything about this, it has been something we've been working on for years, and has been cursed many times over by the government. But thanks to our hard work and Thin the Herd Record's endless bankroll and team of enthusiasts, we have prevailed. This record includes the only studio tracks that Total Shutdown has ever recorded and also includes many extra songs that we have not released before in any form. Blood red vinyl, with a powder blue silkscreen on one side. Silkscreen is of a drawing done by Bob Linder, cover art by Paul Costuros. This record is the first in a six part series created by Thin the Herd Records called the Full Body Cast Series: Sixth Degree Burn. Ours is the First Degree Burn and is the first in a series of six one sided silk-screened records to be released by the Olympian label. Once all six records in the series have been released, they will be selling a "box set - possible biohazard" of all six records together wrapped in gauze. Some of the other bands that may be found in the series are SUNN o))), and Growing. x-mist (11.50 Euro), click on Distribution, then New List for March. Various Artists: Troubleman Unlimited "Mix Tape" Double CD compilation is out now! 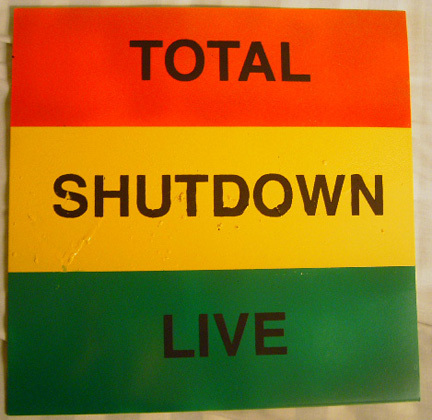 Total Shutdown are the second to last track on disc two and we do a version of song "One" (not the Metallica song), it was the very first song Total Shutdown wrote and performed together. Go to Insound.com to purchase it online for only $12.96. Once your there, go to the grey Annex search box in the top right hand corner and do a search for "Mix-Tape". Make sure the dash (-) is inbetween the words "Mix" and "Tape"
GLASS CANDY and THE SHATTERED THREATRE. This is a Mix-Tape from Troubleman to all their friends. It contains some of Troubleman's favorite bands of the past and present. Troubleman hopes you enjoy this release as much as they enjoyed putting it together. This is the only place you will ever hear these songs. This was released in August 2001. Live May 26th 2001 This CDR was also a tour only release and limited to 50 copies. It had songs that were recorded live on the radio most of which were to end up on the Life is Abuse 7". Was released August 31st 2001. OUT OF PRINT. Self Titled / Reflections This 7 song 25 minute CDR/Cassette was recorded on a 16-track half inch reel with Eli Crews of Spezza Rotto handling the studio. Every song was recorded live. This recording features all of Total Shutdowns original material and features Drums, Bass Clarinet, Guitar, Bass Guitar, double vocals, harmonica, keyboard, and clarinet. This release was limited to near 50 copies of the "servailence" 15 with "koko" cover, and 50 of "Reflections" cover (tour only). Most of these songs were to be on the Reflections 12". Was released with Koko cover and surveillance camera cover on Sept. 27th 2000, then re-released with Reflections cover on Aug. 31st 2001. OUT OF PRINT.